Cast of “The Diary of Anne Frank. Courtesy of Zach Rosing. Used with permission. As I watched “The Diary of Anne Frank,” which I saw at Indiana Repertory Theatre on opening night, January 25, I couldn’t help but reflect on the horrendous impact of the Unite the Right rally in Charlottesville, Virginia, which resulted in a woman being run over and killed in 2017 and last year’s Pittsburgh Synagogue shootings, in which 11 people were murdered. Closer to home, there were Nazi symbols spray painted on the property of a Carmel synagogue last summer. It occurred to me while watching the play, which premiered on Broadway in 1955, that unfortunately, if not tragically, it is still very relevant today. A dramatization by Frances Goodrich and Albert Hackett of the book, “The Diary of a Young Girl” by Anne Frank, the story is based on the diary entries of a young Jewish girl while she was in hiding for two years with her family and others during the Nazi occupation of the Netherlands. The family was eventually discovered and apprehended in 1944 and the following year, Anne died of a severe illness in a Nazi concentration camp. Anne’s diary was discovered by one of the individuals who hid her family, who gave it to her father Otto, the family’s only survivor. He later had it published and it has since been translated into 60 languages. The last time I saw “The Diary of Anne Frank” was in 201l, when it was also presented by the IRT. Prior to this most recent re-visitation of the work, I had seen numerous professional and community theatre productions and yet, this play, with its themes of loneliness, isolation and man’s inhumanity, and conversely, man’s sacrifice for other humans, always resonates with me. It has also been an inspiration and influence on me from the time I first read the book as a high school student because of the optimism, resilience and hope expressed by Anne in her writings. Both the book and play are works that I will always gravitate to. As far as the quality of this particular production, I would say it was among the best of all those I had previously seen, partly due to the superb direction of IRT artistic director Janet Allen. She doesn’t direct often, but when she does, she does it extremely well and with uncommon insight. Also, accounting for the success of this IRT effort was the effective cast, partly consisting of veteran IRT actors and Indy residents, who generally excel in character parts. I have seen these actors on stage numerous times and each time, their individual performances are always convincing. 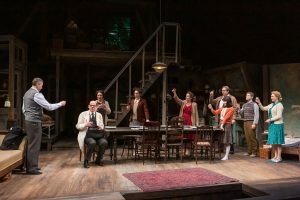 They include Ryan Artzberger who plays Otto Frank, Constance Macy as Mrs. Van Daan, Robert Neal as Mr. Van Daan, Mark Goetzinger as Mr. Kraler, and Rob Johansen as Mr. Dussel. L-R Benjamin N.M. Ludiker & Miranda Troutt – Courtesy of Zach Rosing. Used with permission. The rest of the cast includes five actors based in the Seattle area. They include Sydney Andrews who plays Miep Gies, Benjamin Ludiker as Peter Van Daan, Hanna Ruwe as Margot Frank, Betsy Schwartz as Edith Frank and Miranda Troutt as Anne Frank. As it turns out, this IRT effort is a co-production with Seattle Children’s Theatre, where it will head after the Indianapolis run ends on February 24. 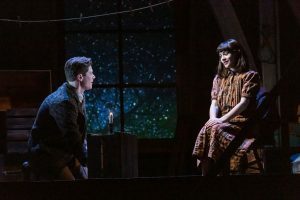 Each of these actors, like their Indianapolis counterparts, turned in strong performances with Troutt and Ludiker as precocious, chatterbox Anne and shy, withdrawn Peter, respectively. They were both believable as teenagers and showed chemistry as their characters developed a love interest in one another in what is essentially a coming-of-age story. Of course, working within an ample budget, no other theatre in this market has the considerable resources and production values that IRT does, so expect Bill Clarke’s set, Yao Chen’s costumes, Andrew D. Smith’s lighting, and Andrew Hopson’s sound score and design to draw you in and connect you to a story that is emhanced by its technical attributes. For tickets and information about “The Diary of Anne Frank” call the IRT ticket office at (317) 635-5252 or visit irtlive.com.